Credits are an amazing way to account for changes that take place over the course of a project, such as refunds, returns, changes in stock, etc. We want to help you understand the process of attempting to create credits on invoices which have applied retainer payments. 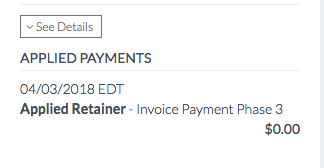 If a paid invoice has an applied retainer payment on it, and you attempt to create a credit by reducing the dollar value of the invoice itself (http://help.ivy.co/ivy-faqs/how-do-i-create-a-credit), the difference in value will first be returned to the original retainer payments. Any leftover funds that you'd like to credit which do not come from applied retainer payments will be found as a separate credit in the project. You have a $1000 invoice, and applied Retainer Payment A for the full payment amount of $1000 to that invoice. When you attempt to create a credit for a returned item in the amount of $500, that $500 will be returned to the original Retainer Payment A, and you should see the balance of this retainer increase by $500 in the Credits/Retainers tab in your project. You will not find this $500 as a separate credit in the project itself.